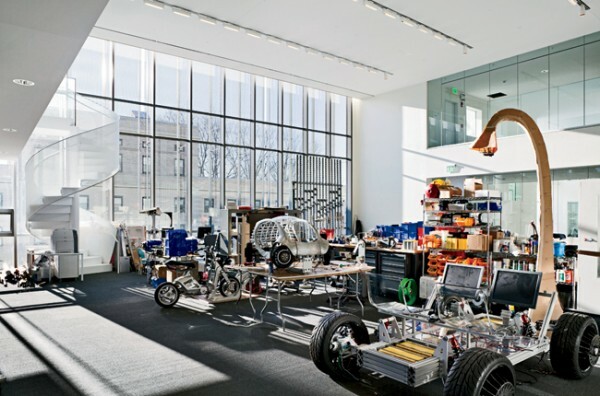 Either resembling to a museum, or having the apple-store corporate look, the modest, metal-glass box, almost 2 years-old MIT Media Lab Complex, is a live example of architecture’s power to affect many aspects of one organization, from social life among community to scientific and technological innovation. 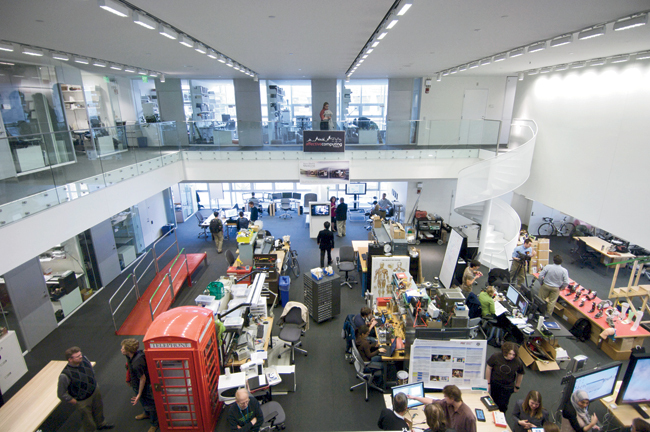 “The Media Lab is an enormous beehive of radical creativity and unconventional learning that brings together ideas, people, technology and resources to collaboratively materialize the craziest projects. With its reputation of breaking down disciplinary boundaries sometimes it feels like a science-fiction spaceship, other times like a messed-up kindergarten and other times like a pristine museum. Whatever need or question you may have, you will almost always find an expert to help you within meters of distance and seconds of time”. When thinking of a campus as a brand, Bill Mitchell would believe in reinventing the architectural style through each new design. This logic of differentiation and innovation, found in his books, and writings, and obviously accompanying his “service” at MIT, may partially explain MIT’s tendency to collect modern architecture masterpieces in its campus. 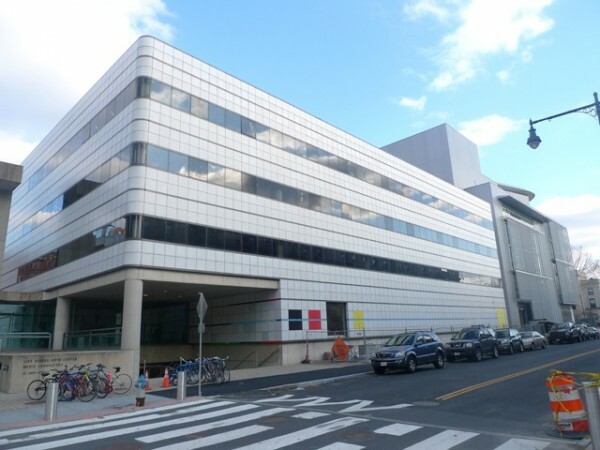 Being an architect himself, but not involved in architectural practice, Bill Mitchell was one, if not the man, behind several MIT signature buildings, one of which was the recent Media Lab expansion designed by MIT alumni Fumihiko Maki. “There was no competition, no string of interviews. 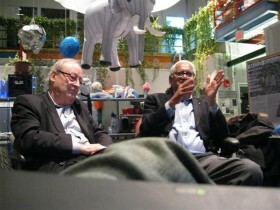 Bill Mitchell, who was dean of SA+P at the time and acting as architectural advisor to MIT president Charles Vest, went directly to Maki and asked if he’d do it – perhaps, Maki surmised, because the site was so tight and the vision so large they figured only a Japanese designer would be able to manage it”. Co-founded in 1985 by Nicholas Negroponte, the inventor of One Laptop per Child, and former MIT President Jerome Wiesner, Media Lab grew out of the work of MIT’s Architecture Machine Group, and remains within MIT’s School of Architecture and Planning. 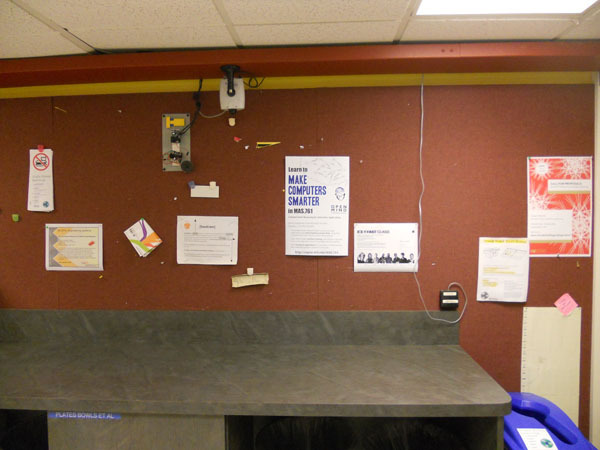 Media Lab was initially hosted in the white, tile-like looking, sterilized Wiesner building, or E15, designed by the Harvard GSD alumni, I.M.Pei. 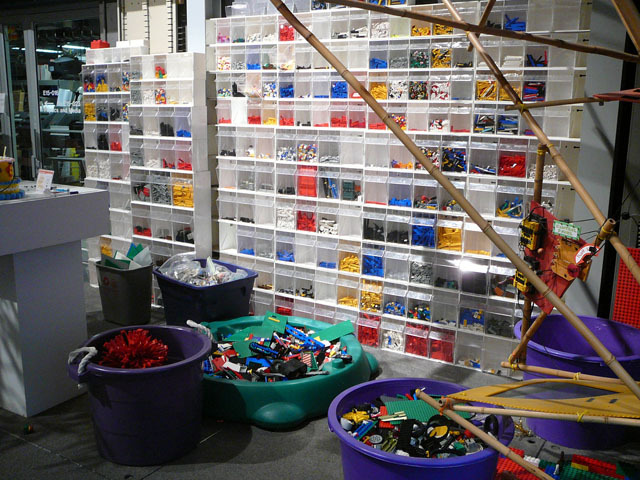 Those in love with technology, design, gadgets, and playgrounds may have experienced the heart of that building, the famous Cube. What is or was the Cube? The Cube, initially designed to be an experimentation space, consists of a spatious open plan, surrounded by small cubicles along its double-height periphery, accessed by colorful staircases and balconies and finally covered by a walkable mesh roof. The Media Lab occupants would use it creatively and untypically: as a place to both experiment and exhibit ideas; a place to work, live and eat; a place to construct games, circuits, inflatables, plants, and robots among other cool inventions. 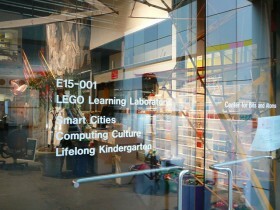 It is not by accident that the Cube would host “Lifelong Kindergarten” group. 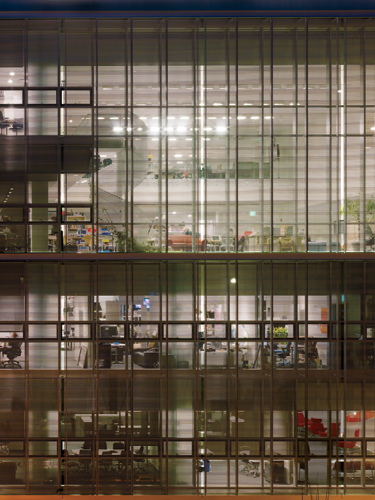 Although the rest lab spaces of the windowless Wiesner building offer more windows in their typical slab-to-ceiling configurations, The Cube would suggest a new kind of a window: that mechanism where one would be able to watch the others (and therefore the future). 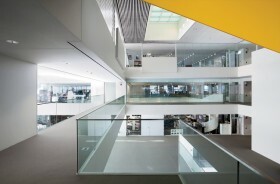 Inspired by the (life and) architecture of The Cube, the “found object” according to Mitchell, Maki conceived the new Media Lab Complex as a synthesis of many interlocking cubes, resulting in a complex sectional configuration that would allow maximum transparency through a very important advantage, that of natural light and energy. 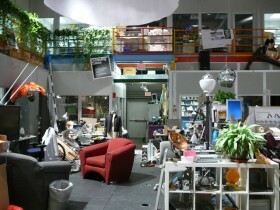 “Its motif came from the Cube, a two-story lab in the Wiesner Building, the Media Lab’s original home next door. A big, wide-open space with offices surrounding it on the ground and mezzanine levels, the Cube has proved to be a perfect space for working collaboratively. 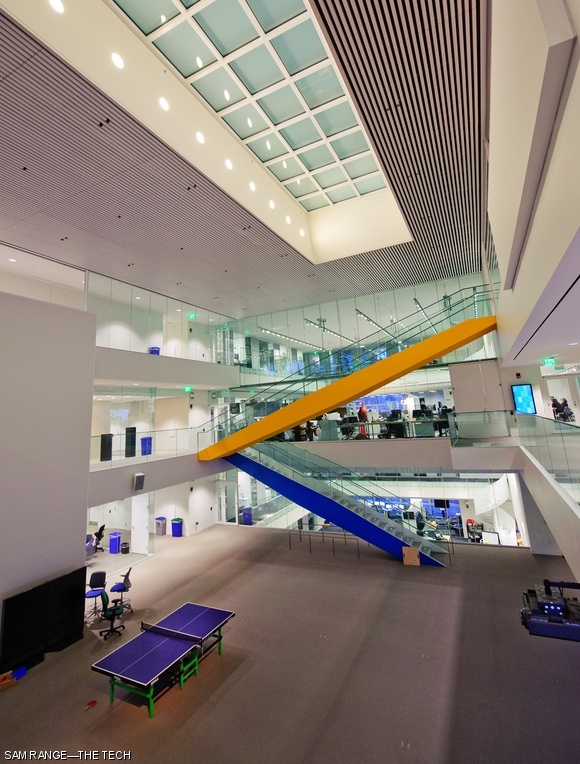 Accordingly, Maki designed most of the labs in the new building to occupy two floors and surrounded them with offices. 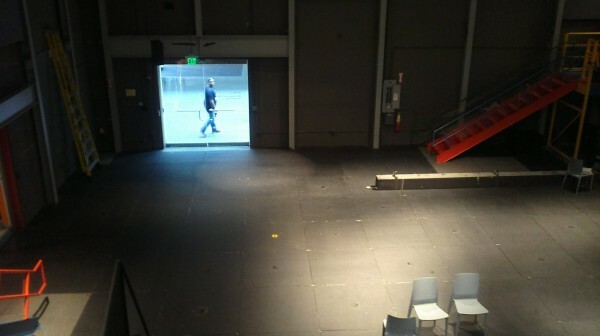 He also staggered the labs vertically so that the upper level of one shares a floor with the first level of another; each one has common space with two others”. The visibility is expanded in many directions through the careful position of both the cubes, which are never aligned, and the interior openings, emphasizing the unusual for other buildings, diagonal view. This openness, usually found in architectural studios – from where Maki claims to be inspired- allows collaboration, competition, innovation, and democratization. 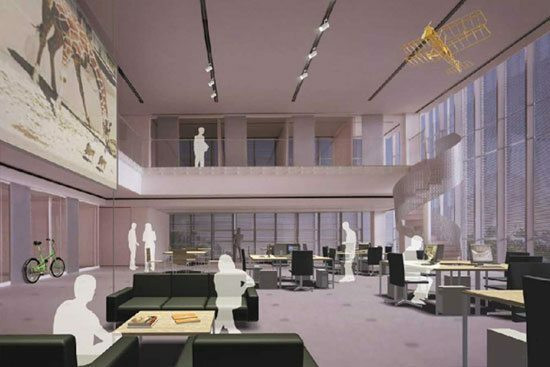 The School of Architecture and Planning website reports that “only 53% of the space is assignable; the rest, nearly half of the building, is designated as shared space”. The openness can reach the level of surveillance: One may claim that this kind of architecture never allows you to stop, sleep, and rest: you are forced to produce and also to act as the cool Media Laber. However Media Labers do not feel that way. Life and work at Media Lab is fun. There is a ping-pong, and free coffee on the 5th along with the relaxing purple lounges; and an the 6th floor balcony with its amazing views. 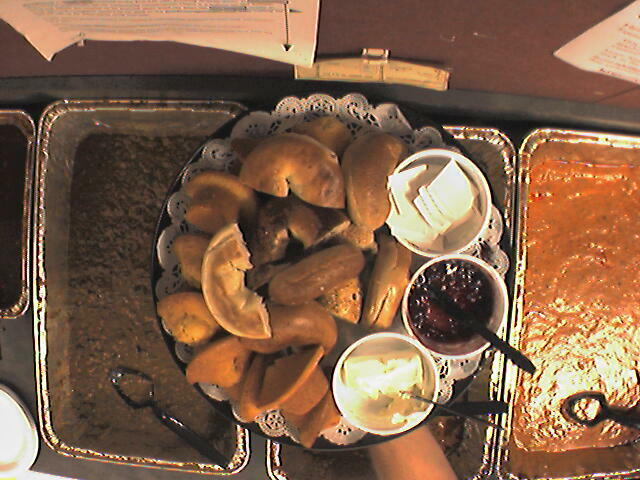 The only thing that is being surveilled at Media Lab is the leftover food from events. It is observed by the rewarding food-camera that informs people via e-mail when food is available. 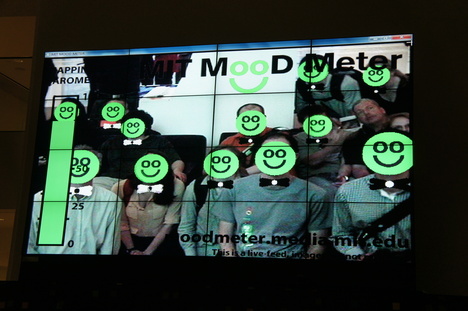 Sometimes smiles are being detected in people faces through projects like the Mood Meter. Awesomeness is also wanted in order to be shared among Media Labers through the “awesome” e-mail list! And what happened to the original Cube? It is currently used by the emerging artists, curators, and activists of the MIT Art, Culture, + Technology program, as an event-experimental space. 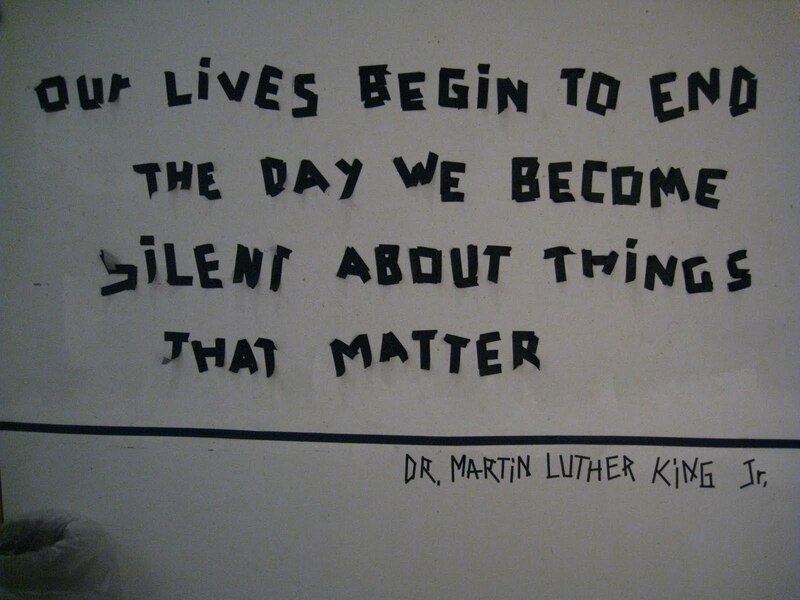 Seeing it people-less and black, some times few of the Media Labers wonder where is its previous messy life. 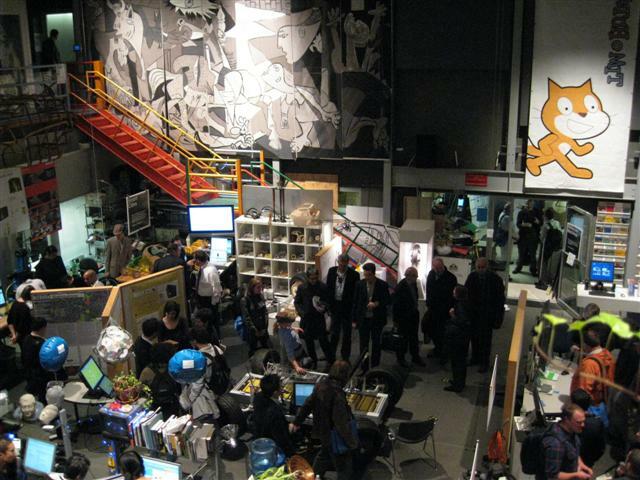 The MIT Media Lab applies an unorthodox research approach to envision the impact of emerging technologies on everyday life—technologies that promise to fundamentally transform our most basic notions of human capabilities. Unconstrained by traditional disciplines, Lab designers, engineers, artists, and scientists work atelier-style, conducting more than 350 projects that range from neuroengineering, to how children learn, to developing the city car of the future. Lab researchers foster a unique culture of learning by doing, developing technologies that empower people of all ages, from all walks of life, in all societies, to design and invent new possibilities for themselves and their communities. 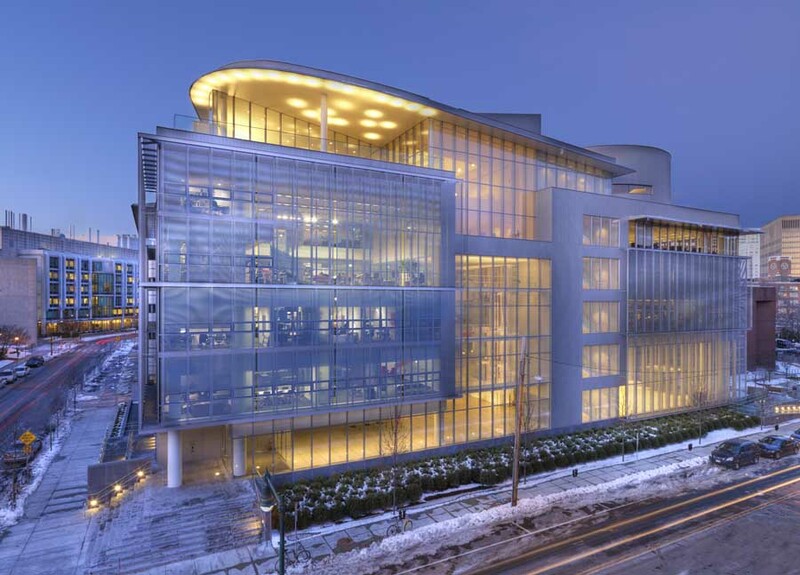 The MIT Media Lab is everything one would expect from MIT. Imaginary, fun and fantastic. Oh my goodness! Amazing article dude! Many thanks, However I am having problems with your RSS. I don’t understand the reason why I can’t join it. Is there anyone else getting similar RSS problems? Anyone who knows the answer will you kindly respond? Thanks! !